There is always something going on at Southlake Fundamental Baptist Church! 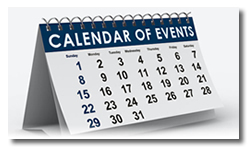 You'll find the latest news, announcements, and upcoming events listed here. If you want to keep up-to-date with all the latest goings on, subscribe to the church blog/RSS feed - just click on the little orange button at the left. The birthday fellowship will be on the 14th this month and will be hosted by Pam. Our Spring Program will begin on March 31 and will continue until April 21. Make plans to invite as many new visitors as you can. Every first time visitor gets to spin the wheel. The top two children to bring the most visitors over three will receive a remote control helicopter. The adult who brings the most visitors over three will receive a $50.00 gift card to Amazon. We will be having a Sunday School teacher's meeting on Sunday, March 24, directly after the evening service. This month's fellowship will be held on the 17th and hosted by Nina. Daylight Savings Time begins on March 10th. Don't forget to change your clocks. This month ladies lunch will be on March 8. We will be meeting at Nokas located in the old courthouse on the square in Crown Point. See you there! Our missionary focus this month is the Frey family serving in China. Please pray for Steven & Megan, as well as their children Matthew, Esther, Seth, and Cherith. Our Kings Kids have been doing a Creation Science program. If interested call office for more details. Please remember to designate your giving for repair projects under building fund. Also please remember to date your giving envelopes so you will receive a giving statement at end of year. A big thank you to those who come early to clear the parking lot and sidewalks. It is appreciated by all. Please remember no eating or drinking in the auditorium. Remember our shut-ins with prayers and cards as well as those under the weather. Keep Arlington and Linda in your prayers as they go through Chemo. Our upcoming Soup Suppers will be held on March 1st and March 29th. Please bring a pot of soup, drinks and dessert, as well as your favorite games. February 3rd was our Beams Bible Day. Our goal was to reach $400.00 to provide Bibles for the people of Burma. We exceeded our goal and raised $560.00. Thank you to all who gave! Best wishes to those celebrating their birthday and anniversary this month. The birthday fellowship will be on the 10th and will be hosted by Carol. Please be in special prayer this month for Dan & Tricia Dubbe, serving in the country of Germany. This month the ladies will be meeting at the Olive Garden in Merrillville for our lunch get together. Come and join us! Our monthly Soup and Game Night will be on the 25th this month, at 5:00 p.m. Bring a pot of soup, drinks, and a dessert. Our newest missionaries are Xavier and Rebecca Lopez Serving in Bolivia. Please add them to your directory and add them to your prayer list. We still need volunteers to host the February and March Birthday fellowships. Please remember to designate repair projects as building on your giving envelopes. Please also remember to put the date on your giving envelope if you are wishing for an itemized statement at end of year. Please remember to turn off lights when leaving a room. We have been having several lights left on during the week. If you use the kitchen please remember to clean up after yourself.